Favorites of the season are ANGELS together with SANTA of course. More on the "dompap"-subject another time. The tree has still some unopened presents from my closest quilting frinds. Yes, more good time ahead just now. And I have started reading Kate Mortons newest book "The Secret Keeper". Sweet dancing angels! Melanie is such a generous friend and so busy that the general belief is she has some extra hours in her days. 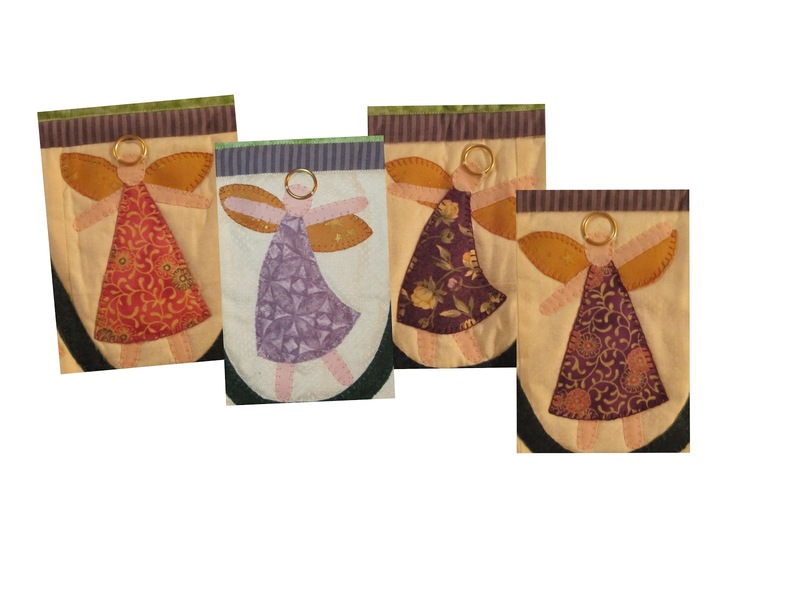 I remembered that you liked angels Grethe, so what better than to send you a few for Christmas. Glad you like them. I hope you have fun opening the rest of your presents this season. What a beautiful table topper Grethe. The little angels are gorgeous. Hope you are sitting somewhere warm and cozy enjoying a good read. You are a very lucky girl Grethe, the table topper is just fantastic. Such a sweet table topper. I love the dancing angels. I love that angel table mat--I am jealous!!! we got more snow here today!!!! Those Dancing Angels are just beautiful! Please can you see if there is a pattern.